How confident do you feel about your job, your financial circumstances and the ability to take on more debt? Not surprisingly there’s a strong relationship between how people feel about their finances and the financial decisions they make and therefore how our property markets perform. If you feel confident about your financial circumstances and the future of property, you are more likely to feel confident to make the big financial commitment of buying a new home or investing in property, and vice versa. 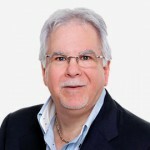 That’s one of the reasons I carefully track consumer confidence and report it here in this blog. Recently Domain produced the following graphic showing the correlation between consumer sentiment and market movements. Clearly, there is a relationship between how people feel about the property market and how it’s moving. Does consumer sentiment change as a result of changes in the property market (negative media, falling auction clearance rates, flatlining of prices etc, or does changing sentiment drive our markets? It’s likely that it is a bit of both. With a high unemployment rate, a hangover from the mining boom and vacant in every street, it’s easy to see why the locals lack confidence. 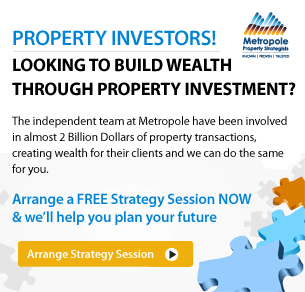 Why would they take on the financial commitment (burden) of upgrading their home or buying an investment. 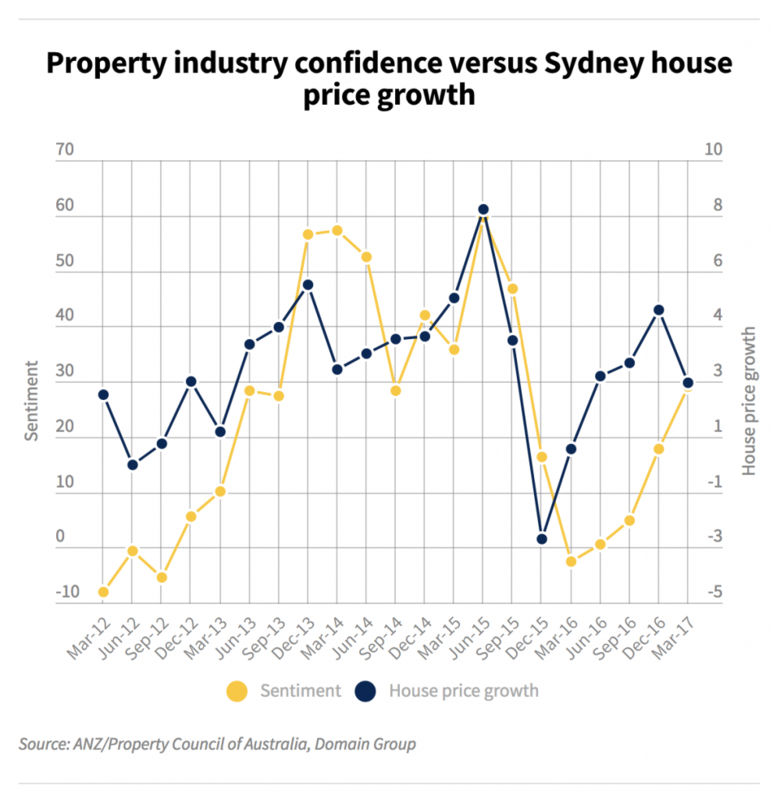 But now, increasing media attention to falling auction clearance results and a flattening of property prices means Sydneysiders are becoming more cautious and sitting on the sidelines waiting to see how things play out. 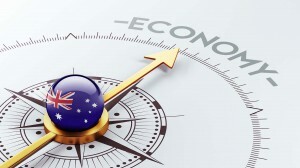 Domain Group chief economist Andrew Wilson, was reported by Fairfax as saying that consumer sentiment is a “lagging” indicator – meaning it shows what has happened after the fact. He doesn’t believe negative sentiment is what causes prices to drop, instead claiming it’s prices falling that increases negative sentiment. 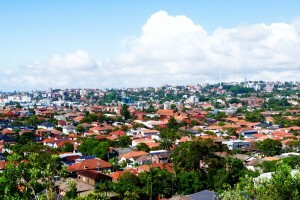 “But the negative mindset does exacerbate the falling house prices, or the increases,” Dr Wilson said. In effect, he thinks it magnifies the way a market is moving – but it doesn’t determine the direction. 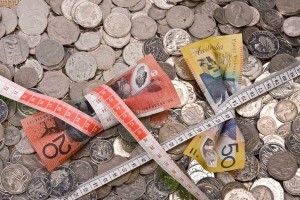 ANZ-Roy Morgan Australian Consumer Confidence slipped 0.6% to 113.4 this week. The detail was mixed; sentiment towards economic conditions improved but this was more than offset by a fall in households’ views of their own finances. Consumers were more optimistic about both current and future economic conditions (up 2.5% and 2.0% respectively). Views towards current economic conditions have improved since the low point in May; however sentiment towards both current and future conditions remains below long run averages. Households’ views towards both current and future financial conditions fell 1.6% last week. Still, both sub-indices are showing some resilience and remain above their long term averages. The ‘time to buy a major household item’ index dropped 3.3% last week, entirely unwinding the previous week’s rise. 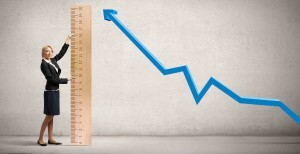 On a four-week moving average basis, the sub-index has been trending down since August. Inflation expectations rose 0.1% to 4.5% on a four-week moving average basis. 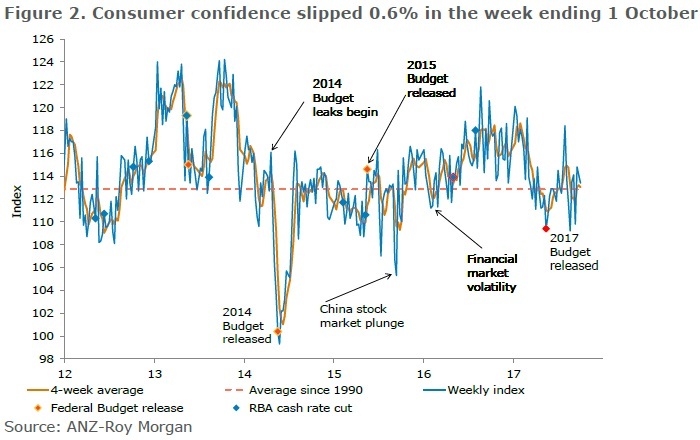 “The slight fall in headline ANZ-Roy Morgan Australian Consumer Confidence once again masks some underlying volatility. Stepping back from the weekly changes – confidence in financial conditions remains above its long term average, which is encouraging given the headwinds households face in terms of high debt levels, low wages growth and higher energy costs. Meanwhile, though sentiment towards overall economic conditions currently sits above its post-budget low, consumers remain uncertain about the longer term prospects.